Parents check-in using their mobile device! Reduce lines, improve efficiency, increase parent satisfaction. After downloading the KidCheck App, parents can start check-in on their mobile device from home, the car, the parking lot – wherever there’s an internet or cellular data connection. Check-in is then completed upon arrival. They simply tap ‘submit’ on their device, the KidCheck PrintHub recognizes the check-in and prints the associated child name badges and guardian receipts. That’s it! No need to stand in line at a check-in station. The Express Check-In feature is available in all KidCheck editions and gives parents the ability to start check-in remotely from their personal mobile device. A licensed KidCheck PrintHub completes the check-in when the family arrives at your facility and enables automated label printing. A licensed PrintHub is considered an additional (lower priced) license along with the KidCheck edition check-in station license you choose. 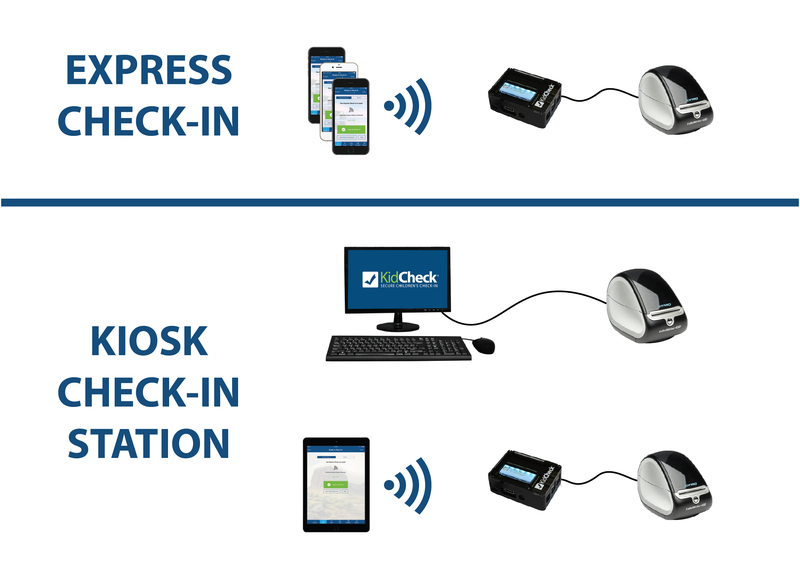 The ability for parents to start check-in on their mobile device with Express Check-In is still available without a licensed KidCheck PrintHub, however then labels will not be prompted to print upon arrival. In this case, families will still need to use a physical check-in station to complete the check-in and print labels. Customer Experience Stories – Read more about how Express Check-In has benefited others.